Just the other day I was thinking that I might have run out of pre-1910 marks, but there are several here next to Fremont High School. Right at the Berkeley line. Each time I find an F. E. Nelson mark from 1909, it’s better than the last. The north end of West Street has a handful of century-old homes. 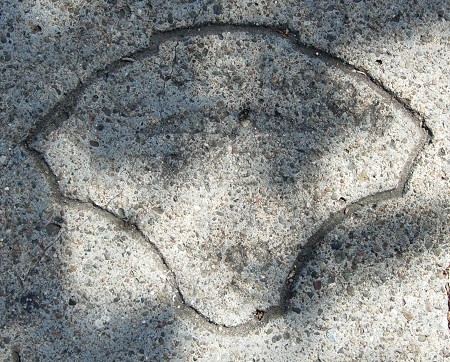 The sidewalk here has no trace of a maker, just this date. Sidewalks of this vintage have curved lines that set off entryways; whenever I spot them I look sharp. The best match to these numerals is the set used by G. B. Burnham, so that’s who I will attribute this mark to. 1909 – Frank Salamid & Co.
With this mark, I now have Frank Salamid marks with the dates beneath all three sides. Even in 1909, Frank Salamid was making every one of his marks different. Compare this to the pair on 38th Street.